The other day, I was reading my friend Stephanie's blog and her post was about how much she loves to sew. She is an excellent seamstress and I am very impressed with her work. Recently, I was given a lovely sewing machine from my gracious in-laws and have been trying to learn how it works. 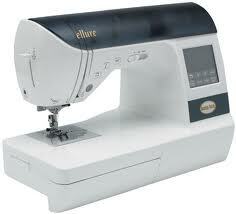 It is a Baby Lock Ellure and it has the capabilities to embroider, as well as, sewing. I got it right before the girls were born so I haven't had much time to really learn how the machine works. Sewing is a hobby that I have wanted to pick up for years but I had no idea where to begin. None of my immediate family members sew, which made me completely clueless on how the process works. So, the other night, I decided to be brave and try to monogram a onesie all on my own. This is how it turned out. Y'all, I tried for THREE hours to monogram these onesies and just failed miserably! I couldn't get the material to stay inside of the hoop, then couldn't get the hoop to snap to my machine, and finally I jammed up the thread into a big ball. I was ready to throw my machine out of the window by the time I was finished. I just couldn't believe something that looked so simple could be so difficult! It was so frustrating to me because usually I can pick up on crafty stuff. Oh, no, not this time! After throwing a temper tantrum, Raleigh looked at me point blank and said, "You need help." So, I got help. While my parents were watching the girls last week, I went to a sewing class and an embroidery class. Y'all, I feel like a new person! Having a teacher explain how my machine works and the steps that it takes to make a garment made all the difference. I think the biggest challenge for me with sewing is that I am not familiar with all of the steps. It is a very methodical process yet there are so many variations of tools to choose from. Take monogramming for example. You know the rough stuff that is on the inside of your t-shirt that is attached to the monogram? That is called a stabilizer and there are like a million different options. Also, the vast amount of monograms to choose from can be rather overwhelming. Do you buy a computer software program or just download them from the Internet? Once they are downloaded, how do you get them to your machine? Then, how do you center it on your machine? Did you know that there is a completely different foot that is attached to your machine to monogram rather than sewing? Who wudda thunk? Not me, that's for sure. So, after my lessons I worked hard this weekend and actually knew what to do. I ENJOYED the process! Never did I think that was going to happen!!!!! The first thing I worked on were these monogrammed onesies. I did Maralee's first and spaced the letters a little too far out. Then, I did Adeline's and got them a hair too close. But, for them being my first official project they turned out pretty well I thought. The other project that I am working on are their christening gowns. We are hoping to have them christened in October or November so I have about two months to work on them. At first, this task seemed rather daunting, but I figured the best way to learn was to dive head first! I think doing a difficult project will really teach me the proper steps on how to make a dress. Also, I have an amazing teacher that tells me every stitch and cut to make before I actually do it. You see, that has been my problem. I have been scared to start any sewing project for fear of messing up the fabric. Last year for Christmas, Raleigh let me pick out fabric to make custom valences in our living/dining room. The fabric is STILL rolled up in the corner of my office waiting to get cut. Maybe when I finish these dresses I will finally be brave enough to start that project! In the meantime, the dress that I am making them is called a Babbett day gown. So far, I have stitched together the sleeves and sides of the dresses. Do any of y'all sew or embroider? What programs do you use? Do you have any favorite websites to get appliques or fonts? Do you have any easy pattern suggestions for making girls' clothes? I am all ears!